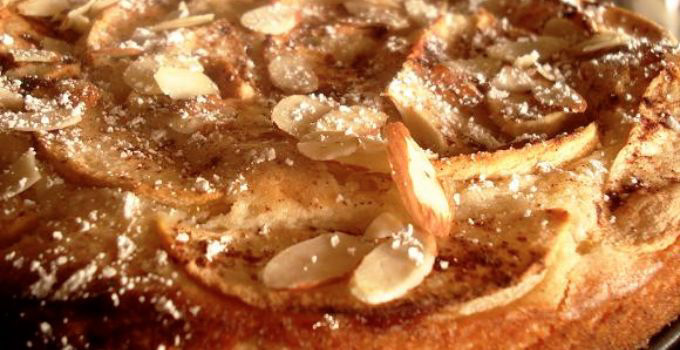 This Apple Cake Recipe is not only delicious but healthy and versatile. Depending on the amount of time you bake, you can make an Apple Cobbler or an Apple Cake. It is extremely quick and simple to make. There is no need to peel the apples, which is great, for two-thirds of the fiber are in the apple skin. Apples are good for your digestion and a healthy skin. We probably know this from the beginning of times. What we have today, though, is a big variety of apples, which makes the adventure of making a great apple cake, or apple cobbler, for that matter, a lot of pure fun! Bake in a preheated 400 F (200 C) degrees oven for about 40 minutes. If you bake it until a toothpick comes out clean when inserted in the batter, you will have a most delicious cake. If you leave it a little undercooked, you have an apple cobbler. In this case, make sure you use very fresh eggs, because the batter will not be cooked through. I personally like to use brazil nuts (just one Brazil nut packs more than 100 percent of the daily value for the mineral selenium, which may help prevent certain cancers, including bone, prostate, and breast cancers. )* and decorate the cake with almond slices.